Mount Gay used to be cool, but now it’s one of *them*. I’m giving this rum zero stars. Is it really a zero star rum? No – probably a three and a half would be more fitting. Maybe even four. 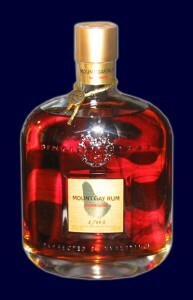 But I’m a longtime fan of Mount Gay Extra Old – a $30 rum that easily achieves 4.5 stars. And so when I try Mount Gay’s new, $100 bottle, I have high expectations. And sadly, these expectations came crashing down. Not because it’s bad, but because its sophistication has reached such a level that it no longer feels like a “rum” experience. Mount Gay 1703 has forgotten rum’s roguish past, and this is why I give it no stars whatsoever. I can already envision the nasty emails I’ll get. Complaints from folks who like hoity-toity rums that boast floral complexities, lack a manly musk, and are technically rum, but “more like a fine cognac.” These people will tell me (as they so often do) that I don’t know what I’m talking about, and that this rum rocks and my beloved Goslings Black Seal is rotgut. But these people aren’t pirates, they’re landlubbers. And the rums that try to appease such folks (sadly, more and more rums lately it would seem) are traitors to the cause. True rum should never strive to emulate the likes of brandy, cognac, or liqueurs – these other drinks should cower at rum’s rough-yet-dashing presence. And rum should kick their asses for their cowardly, froo-froo ways. 1703, however, does no such thing, instead minding its manners as it strives to meet the approval of its new polo-shirt wearing, country club friends. It’s a smashing presentation, no doubt. A squared bottle with gold trappings contains an amber liquid that I would describe is neither “rich” nor “light” – but rather a basic, respectable, middle-of-the-road amber. To the nose 1703 smell more subtle than I’d have hoped – cool and oaky, and with a strong current of vanilla. Upon that first sip, 1703 tastes much as one would now expect – crisp and gentle. The oakiness I love is there, but it’s a friendly oak with the rough edges sanded away. The vanilla adds a touch of richness and complexity, making for a spirit that could well be enjoyed from a brandy snifter while wearing your smoking jacket and bunny slippers next to a roaring fireplace. But then, few of my readers wear bunny slippers, and the only roaring fires they know are those of plundered villages – the sweet flames of victory. And this is not a rum for such occasions, I fear. 1703’s finish does have a touch of heat with a hint of tingle, along with a sensation akin of overripe fruit, but not such a degree as to let you know you’re alive. The sum total effect? A definite top-shelf spirit, and one that sissy lubbers should adore. But this is a pirate site, I review rum from a pirate perspective, and downing a mug of charmingly gentrified Mount Gay 1703 lacks the robust thrill I expect from rum. This entry was posted in Rum and tagged amber rum, mount gay by Bilgemunky. Bookmark the permalink. Even the bottle looks stupid. With the color of the liquid, it looks like some sort of thing that a wizard would use as a health potion. lubbers slain for thar gold without regret. So are you saying you just can’t get behind the gay? 100 bucks for one rum or 7 bottles of black seal. My mind is made up. Oh, come on! Give it the 3 and half stars! Really, I am not of the “more like a fine cognac” crowd. In fact THAT crowd must not know cognac to make such a claim. I’m just an average rum drinker that finds this rum pretty damn good. BTW, I love my Black Seal, too. Rumdog, I gave it zero stars to make a point, and I stand by that point. Those who actually read the review should understand that it’s actually much better than a zero star rum, and those that don’t bother with the reviews… well… keelhaul the blighters! Essentially your “review” is that unless it tastes like bilgewater it’s not worthy of being labeled rum? Hardly, Maestroe. That you equate my penchant for “real” rum to a love of bilgewater indicates you yourself likely have no appreciation for proper rum, and would probably be happier drinking cognac, or at least rums that seek to emulate non-rum spirits. That’s fine. But this website is *MY* house, and I do get sick of hearing from snarky dullards who can’t accept the fact there are those of us that don’t care to see prissy, overly gentrified rums become the new standard for our beloved spirit of choice. I enjoy the ‘cognac’ styled rums a la El Dorado 21 but find this to be reallly really good! I most definitely will buy another bottlle! 4 stars easily!